A United States auto racing venue that pre-dates the Indianapolis Motor Speedway, The Milwaukee Mile has been the site of motorsport competition since 1903. Preserved as a staple venue for Indy car-style racing, the one-time centerpiece for open wheel made headlines in 2010 when the IZOD INDYCAR Series was unable to hold a race at the 1.015-mile oval. The Milwaukee Mile’s historic allure brought the major open wheel racing tour back to the racetrack in 2011 but was hurt by poor planning leading to many questions of whether the event will continue for 2012. Five-time winner at The Milwaukee Mile Michael Andretti would save the race through his sports marketing firm proving the 2012 IZOD INDYCAR Series another chance show-off the 22-lap event as a historical crown jewel. On race day Saturday, rain delayed the start of the Milwaukee Indyfest by around two hours. However, with aggressive track drying, The Milwaukee Mile’s race start was inevitable. Little past two 2pm local time, pole-sitter Dario Franchitti led the 25-car IZOD INDYCAR field to the double-file start. A neat flawless start for almost all competitors, the #10 car of Franchitti benefited from his front starting position to secure a comfortable lead through the Milwaukee Indyfest’s first 63 laps. On lap 28, a pit stop for the #67 Sarah Fisher Hartman Racing car was penalized when Josef Newgarden ran into an air wrench lying in his stall. The penalty for the American driver Newgarden added insult to the injury of losing their 7th place qualifying due to an unapproved engine change. Josef Newgarden would be the first retirement from the event with a mechanical problem reported on the #67 Sarah Fisher Hartman Racing race machine. The first caution of the Milwaukee Indyfest was thrown on lap 67 when Simona de Silvestre’s #78 car was stopped in turn 4. The sole Lotus engined runner currently in the 2012 IZOD INDYCAR Series, the HVM Racing car ended its day with the driver de Silvestro stating, "I just made a mistake.”. With the #10 Target Chip Ganassi Racing car pitting just ahead of the yellow flag period, the race was ultimately out of the hands of the car’s Scottish driver Dario Franchitti. Later in the race, Franchitti would end up in the turn 3-4 wall finishing a season-worst 19th. The Milwaukee Indyfest event would prove tedious for the Target Chip Ganassi Racing squad with #9 car of Scott Dixon penalized with a drive-though sentence for passing under yellow. Several observers including Dixon questioned the officials’ penalty. "I really don't know what happened on the restart where we got penalized. I think the one they waved off was the one we got out of line when EJ Viso was trying to restart at 20 mph.” said Scott Dixon. Running third when he was assessed the penalty lap 123, Scott Dixon and the #9 car was only able to claim 11th place at the end of 225 laps. 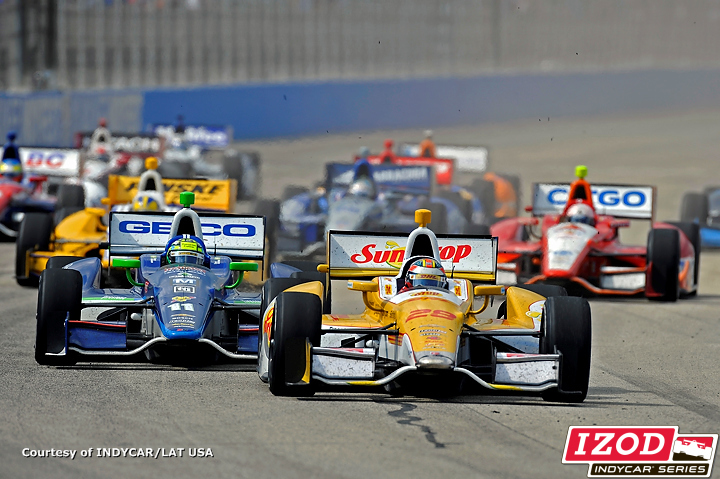 After the 63rd lap, Chevrolet powered would rule The Milwaukee Mile in a dominance not seen since earlier in the 2012 IZOD INDYCAR season. The #3 Team Penske car of Helio Castroneves took the lead from Dario Franchitti with James Hinchcliffe leading a lap through a pit stop exchange. Assuming the lead by staying out on the racetrack while others pitted, EJ Viso in the #5 KV Racing Technology vehicle would lead 27 laps. Viso would turn the lead back over to Castroneves on lap 96 during a caution for Justin Wilson #18 Dale Coyne Racing car sitting on the racetrack with a blown Honda engine. Misfortune would also find Wilson’s Dale Coyne Racing teammate James Jakes who was part of a coming-together with the #15 car of Takuma Sato. Unrelated to the crash between Jakes and Sato, the #4 car of JR Hildebrand was also part of the race’s third yellow period as his car stalled due to a mechanical problem. The winning pass of the event was made on lap 142 when the #28 car of Ryan Hunter-Reay took advantage of a slight bobble by Castroneves. Surviving the attacks under two additional cautions, Hunter-Reay gave the Andretti Autosport group their first victory in 2012. By winning the Milwaukee Indyfest, Ryan Hunter-Reay will have won at least once in all three seasons he raced with Andretti Autosport. "It's amazing. First of all, thank you to all of the fans for coming out, filling a great number of seats in here. What a race. I know we would all have liked to see a little more passing, but from the car it was so busy, just trying to hang on to it. 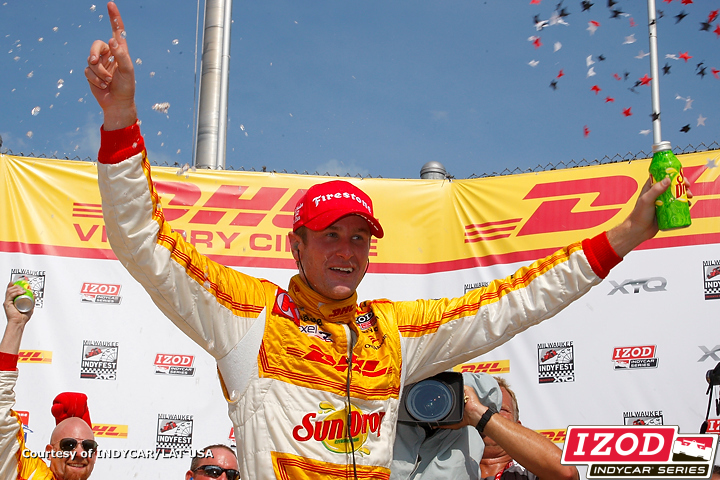 But getting a win for DHL and Sun Drop, it's unreal.” said the winning driver Hunter-Reay. For winning car owner Michael Andretti, the victory in a race promoted by Andretti Sports Marketing was a significant day. Quietly claiming his best finish of the season, Tony Kanaan finished ahead of the Andretti Autosport #27 car of James Hinchcliffe. For another incredible top-5 performance for the Dreyer & Reinbold Racing #22 car of Oriol Servia, the Spanish driver weaved this way from 20th to 4th in the Milwaukee Indyfest. Rounding out the top-5 for the 2012 Milwaukee Indyfest is the EJ Viso’s #5 car for KV Racing Technology. With the top-5 in the 2012 IZOD INDYCAR Series’ The Milwaukee Mile all Chevrolet powered, this was the first win by the bowtie win since the Sao Paulo street race event. After 225 laps in the Saturday event, Alex Tagliani’s #98 Bryan Herta Autosport race car was the highest-finishing Honda-engined runner. The next venue for the 2012 IZOD INDYCAR Series is June 23rd at Iowa Speedway for the Iowa Corn Indy 250 night race.